While we may be the ones holding the leash, animal cognition researcher and dog guru Dr. Alexandra Horowitz says it’s pretty clear who’s actually in charge. 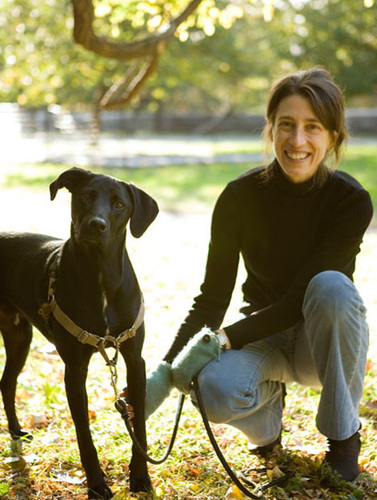 At her dog cognition lab at Barnard College, Dr. Horowitz spends her time trying to understand what life is like from the perspective of a dog: the sights, the sounds, the smells…oh, the smells. While there are lots of things we still don’t understand about man’s best friend, one thing is crystal clear: they’ve got us wrapped around their little paws. This week on You’re the Expert, Dr. Horowitz explains that dogs are furry anthropologists, masters at reading and interpreting human behavior to figure out what makes us tick. Or more importantly, what makes us pull out the liver treats. Dr. Horowitz says dog owners often assume they can understand what their dog is thinking or feeling based on how they’re acting. In reality, canine behavior toward humans is motivated more by what they’ve evolved to do over some 14,000 years as our companions than what they intrinsically feel like doing. Take this classic example: you come home after an evening out to find the contents of your trash can strewn across the kitchen floor. There’s Fluffy, cowering in the corner with her tail between her legs, unable to make eye contact. Clearly she feels terrible for what she’s done, right? Well, maybe not. According to Dr. Horowitz’s research, Fluffy doesn't actually feel guilty about making a mess. But she may have learned that if she acts a certain way, she’ll get scolded less. (Could you yell at a pooch who looked like this?) Owners tend to project human emotions, thoughts, and feelings onto dogs to better understand them, but more often than not, we’re reading way too much into those big puppy dog eyes. To learn more about what it’s like to be a dog – and why their noses are always wet – listen to the full You’re the Expert episode with dog cognition specialist Dr. Alexandra Horowitz here.